Green Tea Facts Quiz - Score Yourself Out of 7! Score Yourself Out of 7! 7 important facts are presented below - do you know the answer to the questions? Is it the second most consumed beverage after water? A 2002 study by McKay reported an average consumption of tea of 120 milliliters a day, ahead of coffee, beer, wine and carbonated beverages. According to the 2003 Datamonitor survey, Turkey and United Kingdom are the most eager tea drinkers in the world. Which tea is most commonly drunk in the West? The most popular tea consumed in America and Europe is black tea, which is fully oxidised. According to Wu, black tea makes up 77% of global tea consumption. Green tea comes second at 21%. 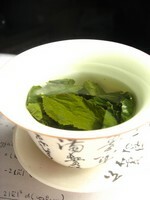 It is most commonly drank in China, Japan, Korea and Morocco. What's the difference between oxidation and fermentation? Green tea is frequently referred to as non-fermented. The correct term should be oxidation as the word "fermentation" implies additives are used. Oxidation occurs when fresh tea leaves react with oxygen molecules they come into contact with. When making green tea, leaves are left to wither for a short period of time. High heat is then applied to kill the enzymes and stop the oxidation process. When is the best time to buy high grade green? Being unoxidised makes green tea highly vulnerable to quality loss. Tea nutritions such as catechins, theanine, chlorophyll and Vitamin C are easily lost when they come into contact with oxygen and water in the atmosphere. This is the reason why low grade greens taste worse than low grade black tea. There is no easy solution. It is not easy to keep green tea at below 6% moisture level under normal conditions. My tip? Always buy green tea in the beginning of the season (mid March). Store in airtight container or freezer and consume within 1 year. Is authentic green tea made of bud or leaves? Properly speaking, green tea is a bud tea. A high grade green is tippy. It is made from young tea buds that grow at the top of tea bushes. There are 3 leaf styles: single buds, one-bud-and-one-leaf and one-bud-and-two-leaves. Tea buds are small. The leaves are so young that they are only slightly unfurled. They are pointed rather than rounded in shape. One kilogram of Dragon Well green tea can have as many as 70,000 to 80,000 of them. Should it taste sweet or bitter? Tea buds have been highly prized by the Chinese people for centuries. They are delicious to drink, contain plenty of powerful antioxidants and promotes relaxation and concentration. This is because important tea nutritions such as EGCG and theanine are found in the highest concentration in buds. According to Dr. Gwenaelle Le Gall, "sweetness is attributed to amino acids, especially theanine, which has the taste described as "unami" or "brothy", while the catechins and caffeine contribute to the astringency." It is this complex flavors with sweet aftertaste that thrill the tea connoisseurs. Many people complain green tea is bitter. They add sugar, honey or ginseng to make it more palatable. In contrast, authentic green tea is drunk own its own. Why is it called green? Fresh tea leaves can be either greenish or yellowish, depending on the type of chlorophyll it contains. Dried processed tea leaves can be greenish, yellowish, brownish or even grayish, depending on the processing method used. Tea liquor is usually pale yellowish-green. Japanese green tea is greener than Chinese green tea because it is steamed rather than roasted. Wet tea leaves are always green. So our forefather decided to call green tea green tea because its leaves turn green when brewing.